When we announced Virtual SAN 2-node ROBO configurations at VMworld we received a lot of great feedback and responses. A lot of people asked if SMP-FT was supported in that configuration. Apparently many of the customers using ROBO still have legacy applications which can use some form of extra protection against a host failure etc. The Virtual SAN team had not anticipated this and had not tested this explicit scenario unfortunately so our response had to be: not supported today. We took the feedback to the engineering and QA team and these guys managed to do full end-to-end tests for SMP-FT on 2-node Virtual SAN ROBO configurations. 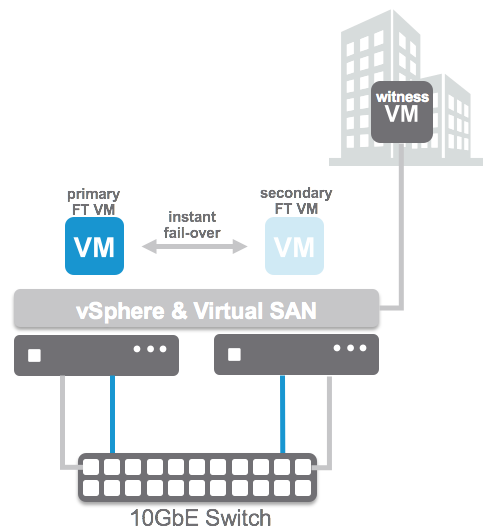 Proud to announce that as of today this is now fully supported with Virtual SAN 6.1! I want to point out that still all SMP-FT requirements do apply, which means 10GbE for SMPT-FT! Nevertheless, if you have the need to provide that extra level of availability for certain workloads, now you can! Does this mean SMP-FT is also fully supported for non-ROBO “stretched cluster” deployments? From an architecture point of view there seems to be no difference, ROBO looks like just a packaging / licensing model to me. SMP-FT is not supported for ANY type of stretched storage at the moment. This is because of the latency and the impact it would have on performance. I’ve seen clusters that are stretched across the street and that shouldn’t have a severe impact on latency. Instead of not supporting a special design, wouldn’t it be better to have latency requirements? Because it’s the latencies that are the problem, not the stretched cluster design itself. Internally at VMware, combination of various slides etc.